4537226 Light Up Brick Key Chain Key Chain set released in 2008. The set features a light-up 2x3 brick attached to a key chain. 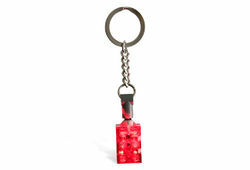 This set is comprised of a key chain with a red Power Functions light brick attached. When the button on the top of the brick is pressed, the brick lights up. This set was also released as 852309 Light Up Brick Key Chain. Facts about "4537226 Light Up Brick Key Chain"
This page was last edited on 12 January 2016, at 20:44.